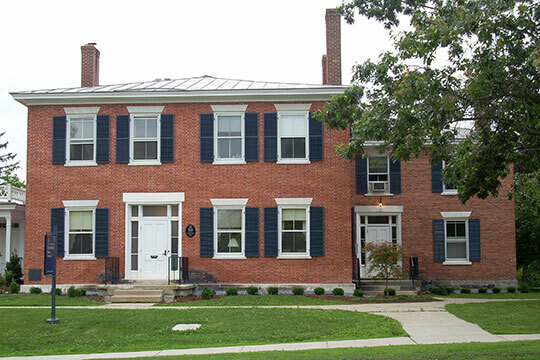 Middlebury Town Hall is located at 94 Main Street, Middlebury VT 05753; phone: 802-388-8100. Photo: Emma Willard House, ca. 1809, 131 South Main Street, Middlebury, VT. Listed on the National Register of Historic Places in 1966; it was designated a National Historic landmark in 1965. Photographed by user:PenelopeIsMe (own work), 2008, [cc-by-3.0 (creativecommons.org/licenses/by/3.0)], via Wikimedia Commons, accessed March, 2015. The first settlements, designed to be permanent, were commenced in the spring of 1773. At that time the settlers in the State, under the New Hampshire title, had become so numerous, as to inspire them with confidence in their strength effectually to resist the claimants under the New York grants. Most of the towns south of Addison County had already been settled, or immigrants were fast passing into them. A few settlements had already been made on the French clearing on the lake shore in Addison, and in New Haven on the creek above the falls, and one or more families had taken possession of lands, on the borders of the lake in Panton and Bridport. Gen. Wooster's claim to a tract of land in the north part of Addison on the lake shore, had been effectually resisted, in the fall of the previous year, by the claimants under the New Hampshire titles. The Scotch tenants of Colonel Reed, who had a grant, as a reduced or half pay officer, including the falls at Vergennes, had, early in that season, been expelled by Ethan Allen and his company of Green Mountain Boys; and all the active New York partisans were in a course of being subdued or rooted out, by the same force. No grants had been made by the governor of New York of lands within the limits of Middlebury, and there were no claimants under that title. Thus the way was opened for the proprietors of Middlebury to enter upon the possession of their lands. Benjamin Smalley from Salisbury, Conn., and brother of the late Rev. Dr. Smalley of Berlin, in that State, was the first immigrant, who brought his family into town. In the spring of 1773, he took possession and built the first log house in town, on his two hundred acre pitch, lying at the mouth of Middlebury River. John Chipman and Gamaliel Painter had been here to look out a place for settlement and make some preparation, and soon after returned with their families. Judge Painter's wife, being a sister of Col. Chipman, they joined forces in making preparations for living in their new abodes. They first built Painter's house, and perhaps had done so before their families came, and there they lived together until Chipman's house was completed. The first houses here, as in other new countries, were log cabins. There was no saw mill in this, or any of the neighboring towns; and if they had the means, they would not have wasted in building more expensive houses, the time needed for clearing their land for the crops, which were needed for their subsistence. Smalley's house was on the site of the frame house, which he afterwards built and occupied to the time of his death. Chipman's house was also near the place where he afterwards built his brick house; and Painter's was north of and near the river, and east of the centre road leading south, and was thrown into Salisbury, by the re-survey of the town line. John Chipman had, before this, in 1766, cleared on his lot seven or eight acres, which was the first clearing in Middlebury. In the spring of that year, he started, with fifteen other young men, for the purpose of looking up, and making preparation for, a settlement in the wilderness. Some of them were destined for that part of New Haven now included in Waltham, bordering on the creek above the falls at Vergennes; some for the lake shore in Panton, and some for the French clearing in Addison. Among the latter was David Vallance, who afterwards settled in that place on the farm recently owned by David Vallance Chambers, his grandson. Chipman and Vallance jointly hired a colored man, with the understanding that he should work half the time for Vallance in Addison, and the other half for Chipman, in Middlebury. This company started from Salisbury, Conn., with a cart and oxen, which conveyed their farming tools and other freight. According to Chipman's account, as related by Dr. Merrill, they found no house north of Manchester. They made their way as they could, through the wilderness, cutting out their path, where there was not room between the trees for their team. They followed up the Battenkill to the headwaters of Otter Creek, which they followed down to the foot of Sutherland's Falls in Pittsford. Here they stopped long enough to make a canoe out of a large tree. They then fastened their cart to the stern of it, loaded their tools and provisions into it, with men enough to row it, while the rest with their oxen traveled through the woods on the bank. At Middlebury they loaded their canoe into the cart, which was drawn by the oxen around the bend of the creek on the east bank, until they arrived at the foot of the lower falls in Weybridge. Here they transferred their canoe to the water and followed the creek to Vergennes. At this time Chipman had no title to the land, on which he made his clearing, or probably any other in Middlebury. The deed by which he received his title to the land is dated January 14, 1773, only a short time before he commenced his settlement. It is probable that when he reached the mouth of Middlebury River he followed up that stream to a place which promised well for a settlement, and there pitched his tent. These were the only families, which had located themselves in town the first year. Eleazar Slasson, the same year commenced a clearing on his two hundred acre pitch, directly west of home lot No. 36, and built a cabin there. The same year James Owen commenced on a part of the same pitch, being a fifty acre lot, which he had before purchased of Slasson. Dr. Merrill says, " James Owen made a beginning but sold to Joshua Hyde." Hyde's deed from Owen is dated 26th June 1781, while both were in Salisbury during the war. Besides, Hyde on his return in 1774, did not settle on any land, which Owen had owned, nor did he until after the war. Samuel Bentley made a beginning and put up a barn on his two hundred acre pitch, north of Hyde's pitch, and near the place where Eleazar Conant afterwards lived on the west side of Chipman's Hill. Jonathan Chipman the same year, commenced a clearing on the second hundred acre lot on the right of his brother Thomas Chipman. This lot lies northeast of Col. Chipman's pitch, and is the same afterwards owned and occupied by Freedom Loomis. Thomas Chipman, the original proprietor, soon after the date of the charter, and before the first meeting of the proprietors, deeded his whole right to his younger brother Jonathan, who attended the meetings and acted as proprietor. In the year 1774, Robert Torrance moved his family into town, and commenced a settlement on the west end of home lot No. 33, in the place where he afterwards built a brick house, in which he resided until the time of his death. He owned also Nos. 31 and 32, lying next north. The same year Bill Thayer settled on fifty acres of Slasson's 200 acre pitch, which he had before purchased, lying west of and adjoining home lot No. 34. Joshua Hyde, one of the earliest settlers, was born in Lebanon, Conn., where his family resided; but when fourteen years of age, he went to live with his uncle, Dr. Joshua Porter in Salisbury, an original proprietor, and remained there until his manhood. In the year 1773, owning a lot of land in that part of New Haven, which has since been formed into the town of Waltham, on Otter Creek, near the falls in Vergennes, he worked on it and put in crops that season. A considerable tract of land in that neighborhood had been granted by the governor of New York to Col. Reed, a reduced or half pay officer of a Scotch regiment, for his services in the French war. Reed had before driven off the claimants under the New Hampshire title, and had put his own tenants in possession. These in their turn were driven off by a company of Green Mountain Boys under Ira Allen. In the summer of 1773, Col. Reed appeared again with a company of recent immigrants from Scotland. The result of the meeting was, that Reed's men went into possession, and the New Hampshire claimants went out. Reed's story was that he paid the men for their crops, and they voluntarily quieted. However that may be, the Scotchmen were not long left in quiet possession, before Ethan Allen appeared with a more formidable force, and effectually and finally banished them from the country. Mr. Hyde, for some reason, thought it not best to return there, and, after remaining a while in Middlebury, went to Salisbury and spent the winter. Hyde, on his way south, met Ethan Allen and his company, on their way to the falls, to drive off Reed's men, and returned with them. In the spring of 1774, he returned to Middlebury and commenced a settlement here. He was before the owner of some land in Middlebury, and about the time of his settlement here, he purchased two whole rights, embracing home lots No. 36, which he afterwards cultivated as a part of his home farm, and No. 83, which he sold to Robert Torrance. He also purchased Skeel's 200 acre pitch. This lot lies west of and not far from the home lots. It was undoubtedly on this lot, that he first settled. The place described by Dr. Merrill is on this lot, and the remains of his house are still to be seen there. William Hopkins this year commenced a clearing and built a cabin on the south part of Oliver Evarts' 200 acre pitch, east of the village, near the place, on which Dr. William Bass, in his life time lived. Daniel Foot from Dalton, adjoining Pittsfield, Mass., which, in some of his deeds, he calls " Ashuelot Equivalent," owned at least four or five home lots and as many second hundred acre lots, in the same neighborhood. Among others he owned No. 5, on the right of Nathaniel Skinner, and No. 6, on the right of Samuel Skinner, both lying west of and adjoining the home lots. In 1774, he commenced a settlement, and built a house on No. 5, southwest from where he finally settled. The remains of the foundation of this house are still to be seen. Simeon Chandler from Arlington, in the year 1775, began a settlement on the west end of home lots Nos. 37 and 38. Daniel Foot had deeded to Enoch Dewey of Pittsfield, who had married his daughter, lot No. 2, in the second hundred acre division, which lies directly west of home lot No. 63, which Mr. Dewey also owned. On the lot which his father-in-law deeded to him he commenced a clearing near where his son Stillman Dewey lived and died. He did not remove his family before the war, and died of the small pox in February, 1778, in the thirty-third year of his age, leaving two children, Stillman and Patty. Joseph Plumley, from Salisbury. Conn., in the year 1775, began a settlement on a second hundred acre division on the right of Ebenezer Field. The lot was afterwards owned and for several years occupied by Billy Manning, then by John Simmons, Esq., and now by Reuben Wright. Plumley died soon after and left a widow and one daughter, to whom we shall refer in our account of the settlement after the war. John Hinman, from Wallingford, the same year settled on a second hundred acre lot, east of lot No. 14 of the same division, in the place where William Carr, Jr., now resides. In this year Samuel Bentley settled on his two hundred acre pitch, on which he had built a barn in 1773. About the same time James Bentley, his father, settled on the north part of the same pitch, where he was living in 1775. Philip Foot, the eldest son of Daniel Foot, in 1775, came to Middlebury, a young man, and commenced a clearing on lot No. 7 in the second hundred acre division, lying west of and adjoining home lot No. 56, and north of No. 6, owned by his father. He also owned No. 8, next north of the other. Eber Evarts, also a young man, and son of Nathaniel Evarts, an original proprietor, began a clearing this year, on a second hundred acre pitch on the right of his father, which is now owned and occupied by Col. Joel Boardman. These, so far as we are able to learn, were the only persons who attempted a settlement in the charter limits of Middlebury before the war. And these had scarcely nestled in their new homes in the wilderness, and were anxiously looking forward to brighter scenes, wider fields and more abundant crops and comforts, when the desolations of war disturbed their repose, drove them from their cabins and terminated their anticipations. In December 1776, and before the family were driven off by the war, Zerah Smalley, a son of Benjamin Smalley, died at the age of eighteen, and in February following, his daughter Anah, of tho age of twenty years, having become insane, wandered into the woods, where she remained through the night, exposed to the severe cold of the winter, and perished before she was found in the morning. Although 110 persons were here claiming lands under the New York title, several of the owners, under the New Hampshire charters seem to have been inclined to recognize the jurisdiction of New York. Daniel Foot, Benjamin Smalley, Thomas Skeels and perhaps others, in deeds given soon after the first settlement, describe their residence as in "Middlebury, in the County of Charlotte, and Province of New York." This seems to have been universal in Cornwall. Some deeds given about the same date say, " now the jurisdiction claimed by New York," or "reputed to be in the Province of New York." But it is known on the other hand, that there were in the town, many strenuous and active opposers of that jurisdiction. Many of the first settlers were the neighbors and acquaintances of Ethan Allen, in Salisbury, Connecticut.